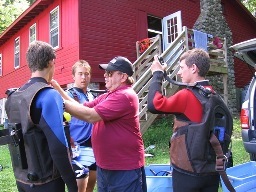 Again this year, CAPT Steve will be offering SCUBA, BSA with an Open Water Experience at Camp Sequassen! SCUBA BSA introduces qualified Boy Scout, Venturing, and registered adult participants to the special skills, equipment, and safety precautions associated with SCUBA diving, and provides a foundation for those who later will participate in more advanced underwater activity. The SCUBA, BSA experience contains two parts: Knowledge Development and Water Skills Development. During the first part, participants learn basic dive safety information and overview skills to be used during their water experience. The Water Skills Development session introduces essential dive skills, such as mask clearing, regulator clearing, and alternate air source use. In addition, participants will have the opportunity to move ahead with a supervised open water introductory experience. Because of the open water component, minimum age for this program is fourteen, and participants must be blue level swimmers. SCUBA, BSA AT CAMP SEQUASSEN! TO CAMP SEQUASSEN FOR SUMMER 2016! 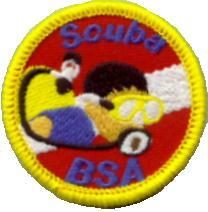 The SCUBA BSA program meets at Camp Sequassen on Wednesday afternoon from 2:00PM to 5:00PM. Cost is $40.00, which must be paid upon enrollment to reserve a space. Please enroll early! Scouts should have all forms completed and their leaders MUST submit them prior to arrival at camp! All equipment is provided, but participants may bring their own masks, fins &/or wetsuits. 1) The first page is completed by the Scout’s parents, then they must take the remaining pages to the Scout’s MD and be signed off for diving on the second page. The first and second pages are then submitted with the other forms. 2) The camp physical form is NOT a substitute for this form. 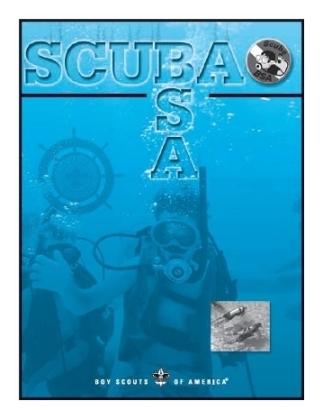 The RSTC form is required for SCUBA IN ADDITION to the regular camp physical form.